Shopping for a new Ford Mustang? We still prefer a 6-speed manual muscle car, but turbo-4 Mustangs with the 10-speed automatic will make everyday drivers happier. The 2019 Ford Mustang may not be the muscly sports car we deserve, but it’s certainly the muscly sports car we need. Whether it’s a coupe or convertible, a base car, a GT, a Bullitt or a Shelby, today’s Mustang drives with verve. It fairly obliterates the badge’s reputation for talent that only ran in a straight line. It’s assertive in corners, throaty at full throttle, and by most performance-to-value yardsticks, a bargain. For 2019, the Mustang Bullitt returns to the pony-car lineup. Ford's also given every Mustang owner an active exhaust system and 1,000 watts of premium audio, because precisely what every 'Stang driver needs more is tinnitus, as if Whitesnake didn't already do their part. At a glance, the latest Mustang reels off greatest-hits styling cues with casual ease. Last year’s changes to the front and rear ends gave it standard LED lighting and a bit of a pouty mouth, but in silhouette, the long roof and well-muscled haunches lift the ‘Stang to a prettier plane. The cockpit doesn’t carry the same distinctive touches off quite as well, and leans on a tech-heavy digital dash package to relieve a case of the drabs. There’s nothing drab about Mustang performance, even in the 310-horsepower base model. The turbo-4 engine racks up torque early and punches out excellent power through a great 6-speed manual or a fine 10-speed automatic, which grants it great fuel-economy numbers. It tends to bound over bumps while it steers with some precision, but every Mustang’s better with a Performance pack or two. The Mustang GT gives us everything we need, and more. Its 460-hp V-8 crackles with excitement via an active exhaust system. Fitted with adaptive dampers, it corners flat and steers cleanly. It’s a daily driver with track-ready appeal–before you even get to the Bullitt configuration, or, if you’re really fortunate, the shatteringly fast Shelby GT350. Mustangs give two people a fast and comfortable ride, but the mid-line seats probably work better for most than the overly snug Recaros. Any two people crammed in back will be rightly peeved. It’s tight back there, though much better than a Camaro. Cargo space is lean, too. Ford fits Mustangs with lots of safety gear, and the NHTSA approves of its crash protection. Every model gets the usual power features, Bluetooth audio streaming, and line lock for tire-shredding. Spend nearly $50,000 and the Mustang brings along cooled front seats, navigation, automatic emergency braking, and a digital gauge cluster that changes its displays as drive modes toggle the car out of comfort settings into something we’d describe easier with guttural noises. The 2019 Mustang telegraphs sports-car realness from every angle. Ford redesigned the Mustang for the 2015 model year, and while it wasn’t universally acclaimed, its greatest-Mustang-hits ethos still works well for the big sports car. The interior’s a bit less successful. Three years into its current generation, Ford updated the Mustang’s looks. Last year it tweaked the headlights and rear end, and left most of the rest of the car unchanged. At the same time, it lowered the nose by a fraction of an inch. It’s not much, but the connection to the ground seems stronger, even if the face seems to frown a bit. At the rear the Mustang has C-shaped taillights that work well; what doesn’t work is the performance spoiler offered as an option, which looks like a cheap, bolt-on unit and thankfully can be deleted from the Performance package. Run through the various Bullitt and Shelby and California and pony packages, and Ford dresses the Mustang up or down with more or less chrome, bigger or brighter or blacked-out wheels, or heritage stripes down the sills. The cabin requires a big step-up in price to upconvert its sort of frumpy, plasticky look. It lost its dramatic twin-binnacle style in this generation, but it can be nudged back into a dramatic look with the optional digital gauges. On Premium Mustangs and pricier models, the gauges come with a higher grade of interior trim, from contrast-stitched leather piped in red or blue. They can also be trimmed in carbon fiber, which covers the gear lever, door panels, and dash–but that kit can’t be combined with the Recaro seats or the digital dash. In any version, the Mustang’s dash still looks and functions better than the ones in the rival Camaro. 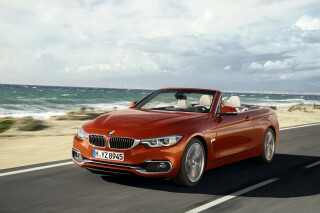 Catch us on the right day and we’d throw the BMW 4-Series under the bus, too. The 2019 Ford Mustang has brisk, almost nimble performance–and that’s just the base car. 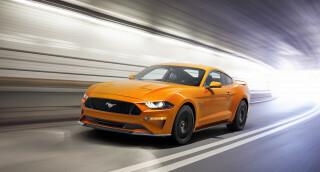 The 2019 Ford Mustang starts with a performance bang, and explodes into a fireworks show of horsepower as it escalates into V-8 power of three different kinds. Its ride and handling have never been better, either, thanks to great steering, stout brakes, and an available adaptive suspension. Ford killed off the old V-6 Mustang last year. The base model now sports a 2.3-liter turbo-4. 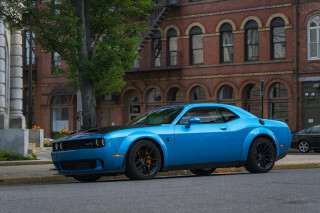 It’s rated at 310 hp and 350 lb-ft of torque, good enough for 0-60 mph runs well under 6.0 seconds, numbers that would make a ‘90s Mustang quake in its shoes. It’s never difficult or frenetic to drive smoothly, since the turbo-4’s power peaks early enough to deliver clean launches (with line-lock control, if you hate tire tread on principle). It sounds like the 4-cylinder it is, despite active exhaust that tries to mimic bigger-displacement engines with more cylinders. It’s still the smart choice that most Mustang buyers make. The turbo-4 mates better with its 10-speed automatic than do other Mustangs. The pair cooperate well, with crisp and predictable shifts, no matter whether it’s in a Sport or Normal driver-selectable mode. A turbo-4 Mustang might work for you. We’ll be over in the Mustang GT, thanks, with its sensual-sounding 5.0-liter V-8. The muscle-car thrill innate to V-8 Mustangs is on full display in the GT. It’s rated at 460 hp and 420 lb-ft of torque, as much grunt as in a top-flight full-size pickup truck. With a newly rev-matched 6-speed manual transmission, it’s a fantastic, fluid performer than can jet to 60 mph in under 4.0 seconds, all for less than $37,000. We choose the manual gearbox, and not just because of its throwback appeal. The 10-speed automatic that’s fine in a turbo ‘Stang isn’t very compelling or comfortable when it’s hooked to the V-8. It’s not tuned as well as it needs to be to cope with the copious power on tap. Sometimes it drops two gears at a time in search of a smooth landing. Other times, it pauses to consider which gear might be best. It needs a new map, a flashlight, and a few rounds of calibration to properly cover the Mustang’s highest peaks and lowest valleys. But did we mention how the Mustang sounds? Its V-8 soundtrack gets driver control, so it can slip quietly out of the neighborhood for a morning commute–or thunder down an empty Nevada road at a wide-open roar. The rear wheels drive all Mustangs, but not all Mustangs drive alike. There’s a common complaint with base cars and those without sport suspensions. On smaller wheels and tires, these cars steer quite nicely, with good weight programmed into their electric power steering systems. It’s the ride that needs to exercise more self-control: it can bound over moderate bumps and squirrel through esses, which makes the lesser ‘Stangs feel less focused than they can be with a few simple tweaks–either a Performance pack or on the GT, the Performance Pack Level 2. From there, we’d also recommend the magnetic adaptive dampers. With them, the Mustang mutes most of the small, quick hits delivered by imperfect pavement, and becomes a classic grand tourer that shrugs off the road with no complaint. Dial the dampers into Sport mode, and the rear end settles down, and the Mustang doles out flat and sharp cornering. It’s difficult to explain exactly how much better today’s Mustang handles when compared to any previous generation of live-axle Mustang, except to say this: today’s Mustang is a true sports car, not merely a muscle car. Ford’s brought back the Bullitt for the 2019 model year. It’s largely the same for performance as the GT, though output rises to 480 hp. Read more in MotorAuthority’s 2019 Ford Mustang Bullitt first drive. As for the stunning Ford Shelby GT350 Mustang, it's an entirely distinct and thrilling beast in its own right. Its flat-plane-crank 5.2-liter V-8 belts out track-ready power, and its magnetically damped ride sets the stage for exceptional road-course handling. It gets brittle on everyday pavement, but in other regards, it's the best Mustang in history. For a deeper dive into that model, take a look at Motor Authority's first drive of the Ford Shelby GT350. The 2019 Mustang has cramped rear seats, of course, but the fronts can be fab. Ford doesn’t pretend the 2019 Mustang is any good at carrying more than two people and their luggage. That said, the Mustang does a better job at comfort than the teensy-cabined Chevy Camaro, especially with optional front seats. Base Mustangs get a decently supportive set of front seats, upholstered in cloth, adjustable in four basic ways. That’s fine, but Premium models have leather-covered power-adjustable thrones with plush padding that makes the Mustang feels as comfortable as a luxury car. Step into a pair of optional Recaros, and the opposite happens: the Mustang’s grip comes into focus between the very snug side bolsters. The Recaros feel so firm in so many places, long-distance hauls aren’t as comfortable as they might be with the other chairs. With any set, the front row offers good head and leg room, and a good driving position thanks to a tilt/telescope steering wheel. Sink into the back seats and buckle up–and could you pull in your knees a bit? The back seats in the Mustang skimp on leg and shoulder room, even in coupes. In convertibles, two passengers will be very familiar after just a short trip. Getting in and out of the Mustang’s back seat is nothing like joy, either, though in all directions it’s better than the current Chevy Camaro. Mustang coupes have 13.5 cubic feet of trunk space, which is fine for a few weekend bags and goodies. Convertibles only muster 11.4 cubic feet, so opt for the checked bags instead of the carry-ons. Powertrain noises are an essential part of the experience, and active-exhaust V-8 Mustangs hardly require a sound system, they’re so pleasant to hear. Other perceptions of quality come down to the interior trim, which varies from hard plastic to a machined-aluminum look, to carbon fiber. The trim can be found on the upper doors and some of the bits and pieces on the center console. We’d stick with the machined-aluminum look of the basic Mustang; opt for the carbon-fiber interior look and you’ll spend more, stare at more windshield glare, and lose access to some options packages. The Ford Mustang can be one of the safer cars of its kind. 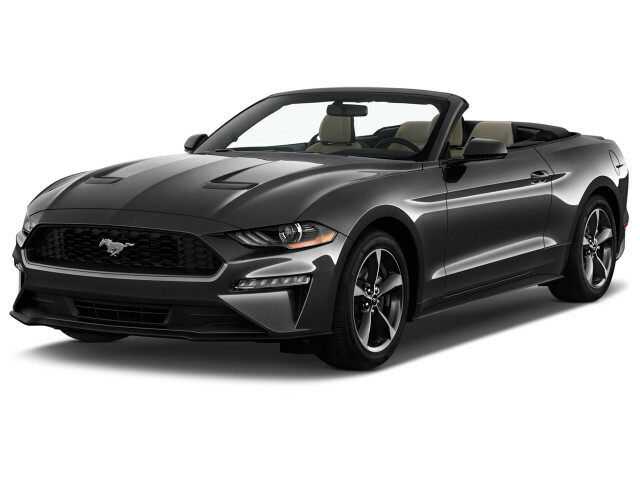 The 2019 Ford Mustang advances the idea that sports cars can and should be safe for their often younger drivers. Radical stuff. Federal crash-test scores are good, and the latest safety technology’s available for a reasonable cost. On the crash-test front, the NHTSA awards the Mustang a five-star overall rating. It’s supported by five-star scores across the board, a rare event for any car. The IIHS doesn’t single out the Mustang for particularly bad scores, but it considers its small-overlap protection (telephone poles, etc.) to only be Acceptable. All Mustangs have LED headlights and a driver-knee airbag. This year all can be equipped with forward-collision warnings with automatic emergency braking, but the systems cost $1,000 on cheaper models. They’re not available at all on some rivals. Other tech gear includes blind-spot monitors, adaptive cruise control, and active lane control. The Mustang has better outward vision than a Chevy Camaro. In coupe models, the rearward view is fairly good, even, though the now-standard rearview camera helps immensely. Ford lets 2019 Mustang drivers spend themselves into a one-of-a-kind pony car. Ford sells the Mustang in Ecoboost, GT, Bullitt, and Shelby GT350 trims, with choices of body styles and transmissions on most versions. Prices for base cars start above $27,000, and for that, Ford includes power features, LED headlights, a turbo-4 engine and a 6-speed manual transmission, keyless ignition, and a six-speaker audio system with Bluetooth audio streaming. Line lock also comes standard: it lets Mustang drivers burn all the rubber they like at the touch of a button, and is easily the most lunatic and necessary standard feature of any 2019 model-year vehicle. On top of that, GT Mustangs get 18-inch wheels, power front seats, and rear parking sensors. Both of these cars can be fitted with a Premium package that tosses in leather upholstery, an infotainment system with Apple CarPlay and Android Auto as well as an 8.0-inch touchscreen, dual-zone automatic climate control, and heated and cooled front seats. A B&O Play audio system has 1,000 watts of sound plus integrated Waze and Alexa services. With this package, drivers can choose a digital instrument pack that brings with it navigation, color-keyed door trim, better upholstery, remote start, in-car wi-fi, and a heated steering wheel. 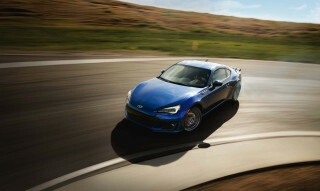 A Performance package tips off either one with stiffer suspension tuning, more grippy tires on bigger wheels, a better rear differential, and Brembo six-piston front brakes. From there, the Mustang GT can add a Performance Package Level 2 with even stiffer tuning that works in beautiful concert with an optional, adaptive suspension, and an active exhaust that bounces sound from a menacing track bass to a quieter commuter mode. Beyond these, Ford will dress most any Mustang with wheels, decals, distinct interior trim, and in the case of Bullitt and Shelby GT350 editions, a raft of badges so passers-by know you’ve picked a Mustang of distinction, not just some pony car. The 2019 Ford Mustang earns better EPA ratings than it should, but only in turbo-4 versions. When the Ford Mustang adopted a turbo-4 engine, enthusiasts shuddered. The EPA smiled. 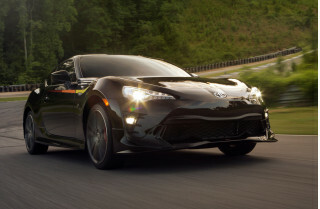 The base engine’s terrific on fuel for what’s still a flat-cornering, hard-charging sports car. The V-8 Mustangs are a different story. That frequently-seen Mustang would carry a 2.3-liter turbo-4, a 10-speed automatic, and a coupe body style. The EPA pegs the most recent version at 21 mpg city, 32 highway, 25 combined. With the available 6-speed manual, highway ratings go down by 1 mpg. Heavier turbo-4 convertibles weigh in at 20/28/23 mpg. The EPA’s most recent ratings for V-8 Mustangs peg the automatic-equipped model at a rating of 16/25/19 mpg. The excellent 6-speed manual knocks down ratings to 15/25/18 mpg. Heavier convertible models with the automatic check in at 15/24/18 mpg. If it’s really a gas-guzzler you want, go no further than the Shelby GT350, rated at 14/21/16 mpg.